Bengaluru, Metro Rail News: Almost one-and-a-half years after the project was opened, it turns out that BMRCL has to raise Rs 664.83 crore more for it. 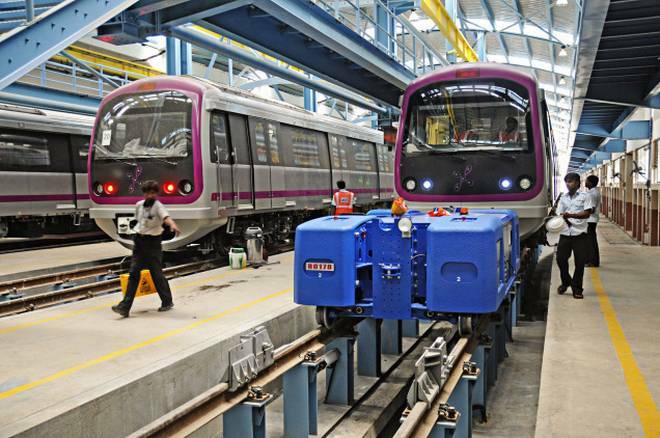 The phase I of Namma Metro is up and running, and has even achieved operational break, but the Bengaluru Metro Rail Corporation is yet to clear its bills. As per the annual report of 2017-18, BMRCL had raised a senior term debt of only Rs 5,046 crore as against the approved amount of Rs 5,689 crore from the multilateral funding agencies for Phase I. Due to the reduction in Japan International Cooperation Agency’s (JICA) loan from Rs 3,689 crore to Rs 3,208 crore. The central government had restricted JICA’s loan amount, apparently due to disagreements over repaying the loan based on fluctuating exchange rates. “We have enough funds as both the governments — based on our requirements — release money three months in advance. There is no point in raising the money and keeping it unutilized. We may have to raise funds in future,” said Ajay Seth, managing director at BMRCL, the company would not raise fresh funds anytime soon. At the present time, the BMRCL is using the funds of Phase II to settle the bills of Phase I, it’s learnt. “There are many cases of arbitration going on. If some of it goes against the company, we may have to raise a fresh loan,” a senior BMRCL official said. Besides, he said, the company only makes a partial payment to contractors in a huge project like the Metro. “The final bill is settled only after the defect liability period is over. The necessity of raising funds would arise later,” he said. Of the total project cost of Phase I (Rs 13,815 crore), the central and state governments together contributed Rs 8,134 crore as equity and subordinated debt. The 42-km network, consisting of a 10-km underground stretch, was thrown open to public use in July 2017. The remaining Rs 5,046 crore was raised as senior-term debt from international agencies, including JICA (Rs 3,208 crore), Agence Francaise Development (Rs 873 crore) and Housing and Urban Development Corporation (Rs 446 crore). For Phase II, BMRCL has a target of raising Rs 12,100 crore, of which about Rs 7,500 has already been raised. While the BMRCL has been able to meet operational break-even levels, the company is staring at a huge outstanding loan. The transport utility, which achieved an operational surplus of Rs 73 crore, was able to pay off the interest to some extent. In the 2018-19 financial year, the interest could accumulate to over Rs 100 crore, it is learned. Bengaluru Metro Rail Corporation Ltd (BMRCL) has released its 2017-18 annual report online Click here to read.